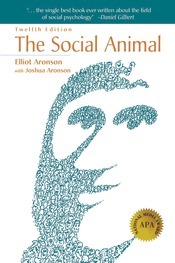 The Social Animal is a CLASSIC text used in social psychology classes for almost 50 years and a powerful introduction to the field for countless students across the U.S. and the world. The new edition of this venerable text retains Elliot Aronson's clear, engaging narrative voice, while adding the scholarly insights of a new coauthor—his son, New York University professor, Joshua Aronson. With a combination of the research and scholarship of the most distinguished father and son in contemporary psychology, The Social Animal, Twelfth Edition, has been thoroughly revised and updated to offer new look into human social behavior across a variety of key topics, including terrorism, conformity, obedience, politics, race relations, advertising, war, and interpersonal attraction.